The pantoum’s pattern of rhyme and repetition is the perfect poetic form for giving us the sense of the four-step forward and two-step backward movement of race relations in America. Americans have been here before. What happened in Ferguson, Missouri, is nothing new. Electing a black president did not make racism a thing of the past. Since the struggle for freedom and justice exploded in Selma, fifty years ago, the journey to Jefferson, capital of Missouri, has been slow and laborious: twenty miles a day. The poet does not know what lies ahead for race relations in America fifty years ahead. She knows only that our future is in the hands of the present generation, the child of today. What that future will be depends upon the actions we take today and the days going forward. Where will we be? Who will we be? I know only that, like a cancer left untreated, injustice spreads and infects all of society: black, brown, and white people. Will those of us who dream of racial equality, of freedom and justice for all Americans, regardless of their color, see their dream realized? 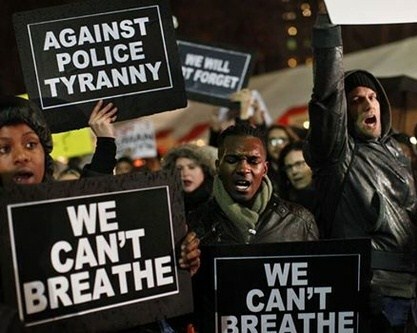 Will we have to continue protesting in the streets, chanting “We can’t breathe” and “Black lives matter”? Will there be an end to police tyranny against black and brown people on our streets across the United States? For today’s African American children, their parents, and grandparents, the struggle for freedom and justice goes on. The future is in our hands, child of today. Together, let all Americans say “No” to the fear, hatred, and criminalization of The Other. At my Poetry Corner March 2015, learn more about poet Angela Consolo Mankiewicz and how she sees her role as a white American poet in our ongoing struggle to make black lives matter. I may be getting into trouble here. And, what I’m about to say isn’t to dismiss the wrongs done in Missouri or the distance we have to go for a fair society, especially for minorities. All that said, I don’t think it is helpful to imply that any of the recent racial outrages are comparable to Selma and the awfulness of the ’50s and ’60s portion of the Civil Rights movement. We hear too many references today drawing comparisons of current events to the “appeasement” of Neville Chamberlain’s behavior at Munch in the late ’30s, or President Obama’s policies to dictatorship, etc. Real understanding, if it is to come, will not be helped by hyperbole. I do like the poem, but I wish it were slightly different with respect to what I have mentioned. Dr. Stein, thanks for sharing your thoughts on Mankiewicz’ poem. The “awfulness of the ’50s and ’60s portion of the Civil Rights movement” is no longer acceptable in a modern civilized society. But the “awfulness” has not ended; it has merely been transformed and hidden from sight. Fear not the man who can destroy your body. Fear the man who destroys your soul. Thanks for raising this, Claire. We now have a new form of slavery. Cyril, thanks for sharing my post with your followers on the Guyanese Online blog.